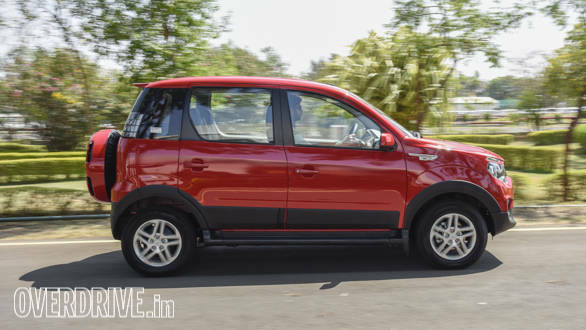 Being the only sub-4m vehicle to offer seven seats made the Mahindra Quanto quite a success at launch. But sales eventually began to thin, primarily because of newer competition but also because the Quanto wasn't perceived as desirable since it was essentially a shortened Xylo. That's where the NuvoSport comes in, as Mahindra's attempt to infuse some SUVness into the old Quanto. Mahindra call it a brand new vehicle as it is now based on the same platform that underpins the new Scorpio and TUV300. Let's start with what's not new. How much is from the Quanto? The pictures simply don't do the NuvoSport justice, at least from the front. In person, the new face is unique, aggressive and quite a head turner. 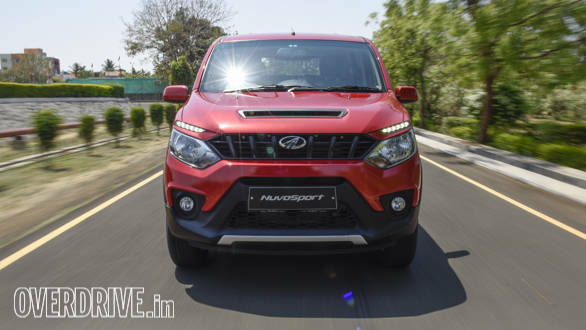 The revised front bumper has sporty looking flares and the slim grille design works well with the new headlamps. The slim light above the headlamps is an LED DRL that looks good and serves it's function well. Thankfully, the hood scoop isn't cosmetic and it feeds cool air to the top mounted intercooler. The NuvoSport's face is its most flattering angle. There's a new air of ruggedness over the Quanto through black side cladding while the metal footboards continue. The windows are huge and make for an airy cabin but also make the NuvoSport look unproportionately tall. All models now run on 16-inch wheels wrapped in 215 section rubber, either MRF Wanderers or Apollo Apterra while the higher models get smart looking alloy wheels. Like the side profile, the rear is familiar but with handsome new lamps, a fresh spoiler, spare wheel cover and a redesigned bumper. Overall, the NuvoSport is considerably better looking than the Quanto but still an unusual looking vehicle. The cabin uses a similar themed dashboard that houses those eye shaped central air-vents. The orange backlit display atop the vents is carried over and it shows both inside and out temperatures, time, gear position and speed. It's a nice touch but not very clear in direct sunlight. Below the airvents is a revised layout that houses a new, 6.2-inch Kenwood touchscreen infotainment system. The unit has good resolution but the angle it is installed in the dashboard makes it hard to read from both the driver and passenger's point of view. Connectivity options are good and there's a choice of AUX, USB, Bluetooth and two power sockets, one in the dashboard and one for rear passengers. The aircon controls are new, classier looking knobs and there's a fresh steering wheel with audio and cruise control buttons for the top model. Also new, is the instrument cluster that includes an interesting feature that tells you how many kilometres the car has been running with the aircon running. The system takes into account time spent in idle and it's a good feature for chauffeur driven owners who'd like to keep an eye on what their drivers are upto in their 'chill' time. The driver's seat adjusts for height but in a similar manner to an office chair where you have to get your weight off the seat to raise it. It's a little tedious to use and doesn't offer a large range of motion. The driving position is commanding but unusual because the pedals are offset towards the right of the steering wheel. Space inside the cabin is abundant given the exterior dimensions. There's generous headroom even if you're over six feet tall and rear knee room isn't cramped. A fully flat floor makes long distances easier for a passenger occupying the middle. The cabin is full of stowage spaces including four cup/bottle holders for the front passengers. Rear passengers get one situated behind the hand brake and two in the central armrest. The seven seat capacity comes via two jump seats at the rear. Space isn't too cramped and both passengers even get a cupholder each. However, I wouldn't use those seats for two reasons. First, there are no seatbelts and second it gets quite hot back there because there is no rear aircon vent and cool air from the front is blocked by the tall middle row backrest. The cabin is spacious, airy and features a flat rear floor. Luggage space is quite good. 414-litres with the jump seats folded away, going all-the way to 850-litres if the middle row is folded and tumbled forward. 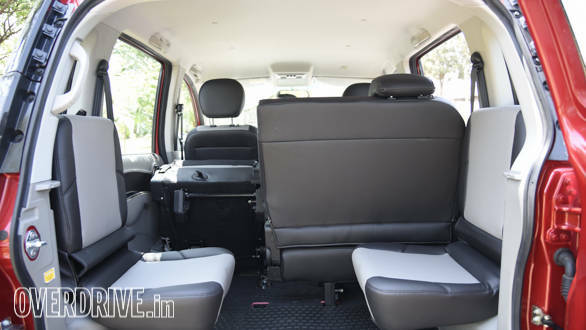 The middle row can only be reclined if the jump seats are released from the sides of the vehicle and laid flat on the boot floor which drastically reduces luggage space. This means middle row passengers can recline their backrest only if there's no luggage in the boot. 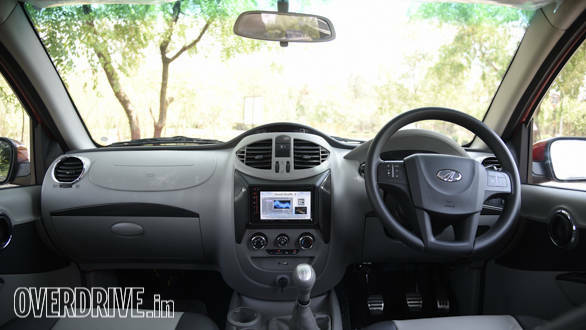 The NuvoSport cabin is spacious, practical and well appointed with features but quality levels are lacking. Different exterior door handles required varying levels of effort while interior plastics were rough and poorly aligned in places. There's also an issue with ergonomics. We already mentioned the offset pedals and difficult to read screens but another irritant was the way the front armrests work. 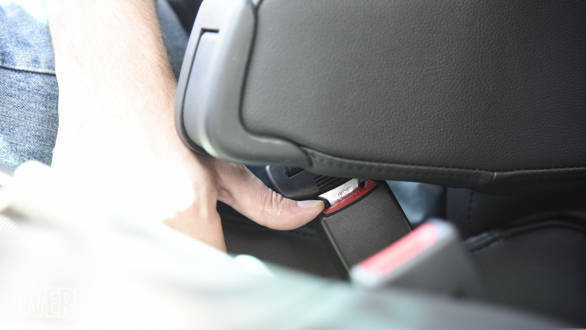 Lowering them blocks the seatbelt buckles and you have to lift the arm rest each time you want to access the buckles. I sat in a TUV300 the same day and the ergonomics and finish are significantly better not to mention the fact that the dashboard looks more premium despite not having a large touchscreen unit. For a vehicle positioned above the TUV, the quality levels are disappointing. What was once called the mCR100 in the Quanto is now christened the mHawk100. 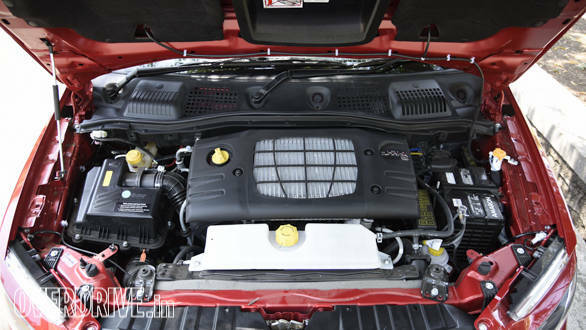 Mahindra says the engine is new, lighter, offers more performance and more efficient. We find this strange as the engine appears identical, both on paper and in images. Aside from the name change, the three-cylinder 1.5-litre engine produces identical numbers - 100PS@3,750rpm and 240Nm from 1,600rpm to 2,800rpm. Claimed efficiency has increased ever so slightly, by 0.25kmpl to 17.45kmpl. The engine has great bottom end and lag is quite minimal, upto just about 1,500rpm. From there it pulls linearly to about 4,000rpm before fizzling out. 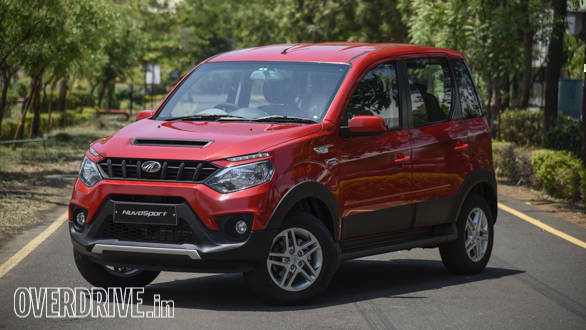 The tech specs appear identical but the Mahindra says some work has been done in improving refinement and noise within the cabin is well restrained. Strangely, the rev counter is redlined at 6,000rpm despite the fact that the limiter kicks in just below 5,000rpm. Either it's a mistake or Mahindra has a petrol engine planned for the near future (which they deny) and accidentally used those dials instead. The diesel is a slow revving mill and you need to release the clutch gently to avoid stalling at low rpm. Do so and the NuvoSport will cleanly pull away from a standstill in second gear. 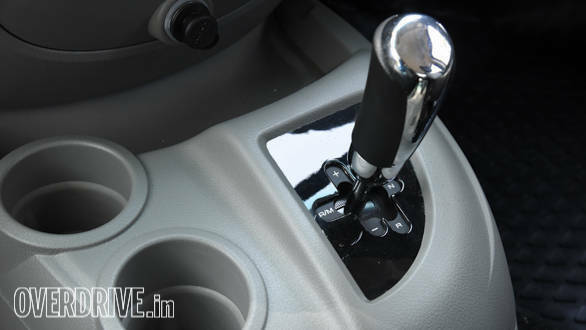 A five speed manual gearbox is standard and it offers smooth but long throws. The clutch also has a long travel but isn't too heavy and shouldn't be too much of a pain in traffic. We also got to try out the AMT equipped model. Built by Ricardo, the five-speed AMT is claimed to have been worked on for quicker and smoother performance than the TUV300. The changes are not revelatory and like every other AMT on the market, shifts are slow and lazy in AT mode and a hair quicker if you shift manually. Those who enjoy their driving won't be impressed but for buyers looking for point A-B ease of transport,the AMT will appeal. Mahindra only allowed us to drive the NuvoSport on a 1km oval loop at their plant. It was enough to tell that the engine feels very similar to the Quanto and not quite as powerful as the specification sheet would suggest. Of course the lardy 2,220kg gross vehicle weight is mainly at blame here. The 1km test loop was sufficient to understand the engine but too controlled an environment to discover much about the chassis and suspension set up. Still, it is quite clear that the NuvoSport is biased towards comfort - there's considerable body roll in the corners and softness under braking. The new chassis claims to use a wider track to aid stability but the sensation of a tall centre of gravity persists. Braking performance feels adequate at best and requires a firm press of the pedal for quick stops. Despite the name, the NuvoSport has little to do with sporty dynamics but I suspect it will be quite comfortable on rough surfaces. Whether Mahindra has tamed the bouncy rear suspension tendency of many of its products remains to be seen in the real world. As an upgrade to the Quanto, the NuvoSport works well. It looks nicer, offers more features and I'm pleased to see ABS and dual airbags as standard on all but the base model (Rs 30,000 lakh extra will get you those two vital features even on the base N4 as the N4+). The fact that the AMT is available on both the mid N6 and top N8 trim is another appreciable decision. Only a road test will reveal if the NuvoSport drives better than the Quanto so we'll save that opinion for later. An improvement? 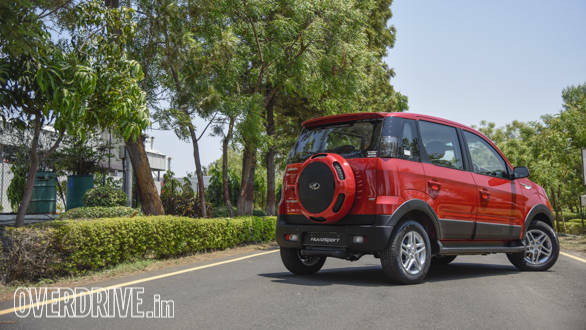 Definitely, but there's the lingering feeling Mahindra could have taken it a step further. Since the chassis and engine are new and not much of the Quanto's parts have been retained why not be more adventurous and design something completely different? With an iconic product like the Scorpio it was understandable not to make too strong a design departure from the original. 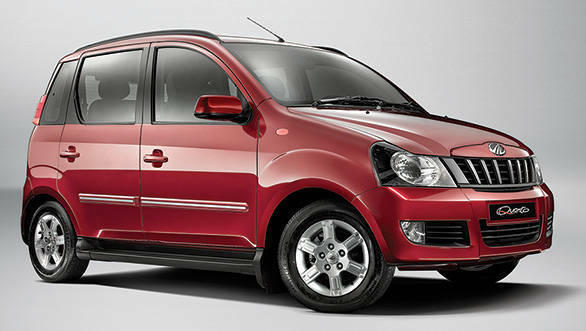 However, the Quanto was never such a big product which gave Mahindra the freedom to try a different approach. Granted, it would have cost considerably more to develop but the result could well have made it worthwhile. Nevertheless, the NuvoSport is an improved package and aside from some quality issues it is worth your attention.